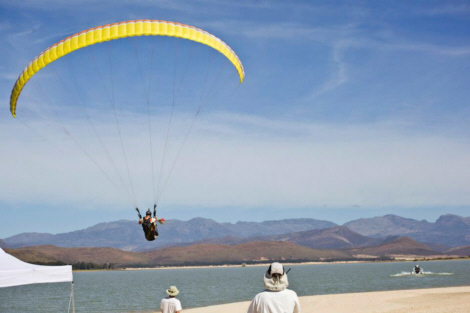 DESCRIPTION: Brandvlei Dam is a boat-winch site mainly used for SIV courses. - 10km E; FAD157, SFC-FL70. LAUNCH: Grass strip by die Yacht Club with various other take offs around the dam depending on wind direction. - Worcester Airport and Sailplane Winch Park immediately adjacent to the dam. - Do not fly without prior arrangement. - Do not fly without airband radio. - SE in summer, NW in winter usually blows out in the afternoon with no/little warning. - Drive from Cape Town on the N1 towards Worcester. - Take the 1st off ramp at Worcester. - Turn right towards town. - Drive for 3km until you get to a T-junction. - Turn right into Durban Road. - Drive for 4,5 km to another T-junction, Nekkies resort will be on your left and the entrance to the Yacht Club in front of you. - Enter the Yacht Club and pay at the booth. - Members and guests only. - Sign in at the Yacht Club. SITE FEES: See site rules.